If you want to know about resilient/vinyl flooring, welcome. Maybe you’ve never heard of resilient/vinyl flooring and just clicked here out of curiosity. Maybe you’re aware of it and want to learn more. Or maybe buying resilient/vinyl flooring for your home is a done deal and you’re shopping for ideas and applications. Welcome to the unique and surprising world of resilient/vinyl flooring and our universe of information, a universe with just one goal. We want you to know all about the flooring called resilient/vinyl. Whether it’s at our store or here in our website, we want you to understand, learn, experience -- know -- as much about resilient/vinyl as you need to. We call on our experience to provide you with valuable information, delivered in an easy to understand way, so you make the smartest decisions for you, your family and home. First, allow us to clear up some of the terminology so you can be a smarter shopper in this category of flooring. Resilient floors, as the name implies, have some "give" or elasticity when you walk across them. Resilient floors are often used in kitchens and baths because of their good looks, resistance to moisture and wide variety of colors and textures. No matter which resilient floor you choose, you will find stylish options, high performance and tremendous value. You can completely customize your floor by mixing contrasting colors patchwork style, creating medallions or curved cuts that express your unique vision and personality. Let your imagination run free! Now, some resilient floors are vinyl but not all vinyl floors are resilient. 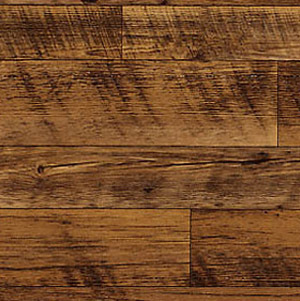 However, the most common type of resilient flooring is vinyl, which is why most of the sections in this part of the website are labeled Vinyl. There are two types of vinyl flooring: sheet vinyl and vinyl composition tiles (VCT). For our purposes here, and throughout the rest of the sections, we will refer to sheet vinyl simply as vinyl, or vinyl flooring. VCT has all the advantages of vinyl, is available in a wide array of colors and can look good anywhere. Spare vinyl composition tiles can be kept on hand to repair worn areas, and the VCT format opens up unlimited possibilities for creating your own unique patterns. However, vinyl flooring also offers you many tempting advantages. In fact, no other floor covering category offers you the selection, styling, ease of maintenance and value as a vinyl floor! Thanks to some great advancements in styling and technology, vinyl floors have been changed forever. 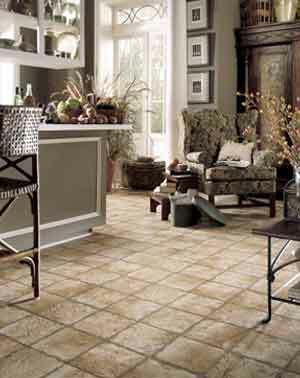 Vinyl flooring can now realistically mimic the look and textures of real resilient, stone and wood grain patterns. These amazing replicas have such incredible realism it is difficult for most people to tell whether it's the real thing or not. Who needs to know, right? Finally, a note about linoleum, which is not a resilient flooring but the one you probably recall as the original kitchen and bath flooring. While linoleum, because it is a "natural" flooring material, is enjoying somewhat of a renaissance, the most popular floor covering material in this category is vinyl. 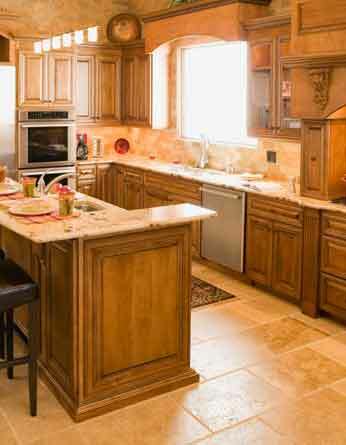 But never fear, we want you to know about linoleum, and cork, rubber and specialty resilient flooring. Just click on the sub-section called Specialty Products and learn about them. And don’t forget to explore all the other Vinyl sections for more important information, more exciting, fashionable choices, and a possible flooring solution for the way you live. In a class all its own, today’s vinyl flooring offers you a wide spectrum of exciting choices and unusual design options. If this product is a possibility for you, then we invite you to explore all the other vinyl sections because…we want you to know!